Overhead Door Company of Polk County was started by Leo Woodard in 1971 and moved to our current Lakeland, FL location in 1982. Our primary focus is to provide our customers with the quality of the Overhead Door product, coupled with the fairness and integrity of trained employee service technicians. This foundation was built over 40 years ago, and it has allowed us to steadily grow through the years, while still providing a quality product at a fair price. We also take pride in helping the members of our community via different philanthropic organizations. 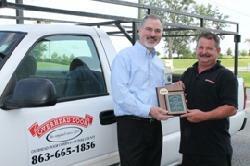 In July 2014, The Lakeland Area Chamber of Commerce presented Overhead Door Company of Polk County with their Small Business Award for our dedication to the community.